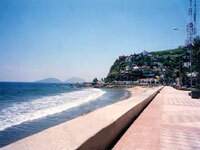 The holiday destination of Mazatlán is the most important port on the Pacific coast of Mexico. It is also the shrimp capital of the world, with the largest fleet of commercial shrimp vessels in Latin America. This attractive city also has the reputation of being one of Mexico's premier beach holiday resorts. The contrast between commercial port and tourist resort is interesting and sets the place apart from other popular resorts. Travellers will find world-renowned deep sea fishing, miles of lovely beaches, excellent seafood, a variety of water activities and a choice of accommodation to suit all tastes. Fondly called the 'Pearl of the Pacific', Mazatlán boasts Mexico's longest and prettiest waterfront promenade, or malecon. This is the city's defining characteristic, and much of the city's life can be viewed from here. The colonial old town centre is the heart of Mazatlán, where the busy main plaza, alongside the 19th-century cathedral with its blue and gold motifs, and the open-air market, are a hive of activity. The city emanates a combination of laid-back seaside charm and affordable luxury, its beaches lined with bars and outdoor cafés, and the sky above filled with colourful parasails. Sunbathers and hawkers compete for space on the city beaches, and fishing vessels and jet skis circulate in Mazatlán bay. Mexico is a great place to shop for diamonds because the gems can be purchased here tax-free. The best place to seek out jewellery is Mazatlán's Golden Zone (Zona Dorada) tourist area. The streets of the Golden Zone are a paradise for greedy shoppers, where jewellery, designer clothes, seashell souvenirs and almost anything else imaginable can be found within the tiny boutiques and vast emporiums. The Mazatlán Arts and Crafts Center is a treasure-trove of handmade goods. Wandering the Central Market in Old Mazatlán is a colourful shopping experience, with busy street food stalls under bright umbrellas in front of little stores selling a hodge-podge of crafts, clothing and novelties. Away from the sea, on the Avenida de los Deportes, is a large shopping mall, La Gran Plaza, which has a supermarket stocking essentials. Shops generally open from around 10am and stay open until late. Shrimp in every guise is the mainstay of Mazatlán restaurants. A favourite spot for tasting this tempting crustacean is the tourist-oriented El Shrimp Bucket on Olas Altas, the original of the chain of restaurants that has proliferated throughout Mexico. Great cuisine here is not confined to shrimp, however: Asian and Italian restaurants abound, along with some superb authentic Mexican eateries. Favourites among these include Cenaduria El Túnel, near the Angela Peralta Theatre, famed for its chicken gorditas and the best pozole (pork stew) in town. There is a fairly good choice of dining options around the Plazuela Machado, including the upmarket al fresco Pedro y Lola. For a quick snack opt for a hotdog or taco from a street stall, or find a cheap meal at the Central Market where a few restaurants offer inexpensive daily specials. Mazatlán, like any busy seaside resort, has a lively nightlife with a plethora of dance, live music and drinking venues. Extremely popular are Mexican fiesta theme parties that are organised by the larger hotels. Most of the nightclubs and popular pubs are to be found in the Zona Dorada, offering a variety of music from chilled piano playing to lively local mariachi groups. One of the favourites for locals, offering sizzling Latin beats, is Mundo Bananas, on Avenue Camaron Sabalo. The young crowd tend to favour the Fiesta Land complex at the southern end of the Zona Dorada, which is packed with restaurants and lively clubs like Bora-Bora and Valentinos. Those whose tastes run to other than dancing will find plenty of sports bars, karaoke bars, cocktail bars, and brew houses in which to spend a fun, social evening. The focus of daytime fun on holiday in Mazatlán is on the tourist beaches of the Golden Zone, Playa Camaron and Playa Gaviotas, which are generally as packed with vendors of all sorts as they are with sunbathers. Playa Camaron, with its yellow sand studded with small seashells, lends itself ideally to bodysurfing, because of its steep drop-off. Further north the beach becomes Playa Gaviotas and the sand texture becomes smoother and the slope more gentle, with waves lazily rolling in. All along the beaches it is possible to indulge in watersports of all sorts, including parasailing, jet-skiing, hobie-catting and boogie boarding. Snorkelling is rewarding here, particularly at Deer Island. Also popular is horse riding, or for those averse to the saddle, a trundle in a burro-pulled cart. Mazatlán caters particularly well for keen golfers, who can tee off at the magnificent Estrella del Mar 18-hole course, designed by Robert Trent Jones Junior. Whatever time of year one visits Mazatlán it is likely there will be a circus, fair, fiesta or sports tournament on the go, and the eagerly awaited bullfight season draws the crowds on Sundays between January and May. Dozens of local tour operators offer day excursions on sea and land to nearby places of interest or excitement, like sport fishing for marlin or driving to an inland village for a leisurely lunch. There are lots of hawkers on the beach in Mazatlan and this can become a nuisance to travellers. Don't stray too far from the tourist areas alone as travellers are easy targets for petty crime.